Browser usually limits opened connections at one time to 6 - 8. Roblox Studio (and maybe Roblox engine also) does tha same. What does it exactly mean? Roblox engine can continue only 8 connections at one time. New need to wait until previous get closed (get response) and this is good behavior. However Roblox Studio should close the pending connections when test is stopped. Instead it attempts to continue them in some background queue. If you’ve got a polling server (which sends response after eg. 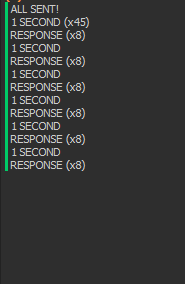 10 seconds) you can run 5 * 400 requests in 5 tests. At the last test you won’t get any response until these from previous tests are completed. The way to reproduce it is running a server and a studio and it happens always. Here are scripts to do that. spawn(function() while wait(1) do print("1 SECOND"); end; end); -- Print that to separate the "packets"
It isn’t hard to notice the behavior. And so what’s on later? Alright. And now. Run test, don’t wait for the requests to finish, stop test and run again. 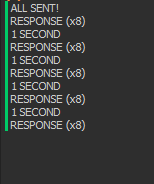 You won’t get any response for a long time (until these from old test are closed - completed). And so that’s exactly how I wasted 2 days by looking for issue in my scripts. Hard to test polling services later as you don’t get any results later due to the opened connections.